Do you believe that you can handle radical power and the sheer brute force of the Traxxas 8S X-Maxx? 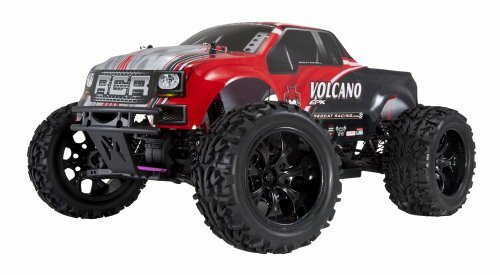 If you can, this speed tuned rc truck is bound to win you a few races and competitions! It will conquer the roughest and toughest tracks with its mammoth tires and a revolutionary power system. Traxxas has been a pioneer in the world of RC cars. It has churned out one monster after another! 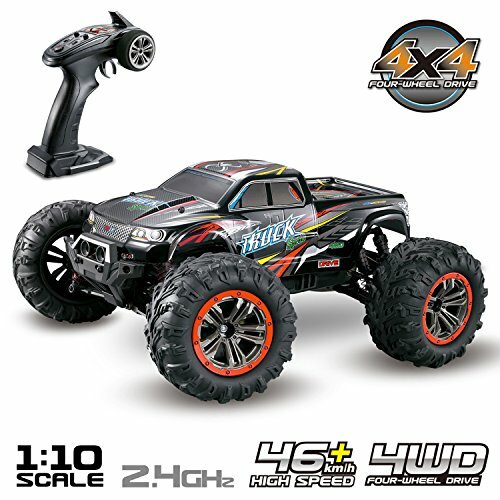 Any RC car fanatic knows that the X-Maxx series comes from a long line of legendary RC cars. The 8S X-Maxx is no different. On any race track, it will dwarf other cars and plow through any obstacles. So, what makes it superior to others? Well, in short, the X-Maxx can reach a top speed of 50+ mph, while others we’ve compared top out at around 30mph. It features an all-new torque biasing center drive that improves durability and ensures super speed, precision, and control. It is due to its innovative features that it has managed to gather 4.8 stars out of a possible 5 on our review! Already hooked in? Ready to find out more? Read ahead for our comprehensive Traxxas 8S X-Maxx review to find out what this beast has to offer! Can race through any track. Top speed of above 50 mph. Durable and sturdy metal body. 4 inches of ground clearance. Strong axles and powerful differential. Easier wrenching due to modular design. The batteries and charger cost extra and are expensive. Reports of the not being waterproof. Only limited suspension adjustments are available. The X-Maxx includes one of the best management systems for transmitters which ensures you maximum control of the RC truck. The Traxxas stability Management or the TSM for short automatically adjusts the power of the truck when turning at high speeds. This allows you perfect control of the car during turns and ensures it does not crash. Included with the transmitter is a multi-function knob that allows you to tweak how much the TSM controls your turns. The X-Maxx is equipped with a 1200XL Big Block Motor that helps to propel X-Maxx forward. The motor is a brushless 1600 KV one which means it offers higher efficiency than those with a brushed one. Further, there are fewer moving parts in the motor, which ensures the motor does not wear or tear down due to friction. The X-Maxx comes with the powerful Velineon VXL-6s Speed Control that works on up to 22.2 volts. This allows the RC Truck to achieve a maximum speed of 50 mph. The ESC is supposed to be waterproof, and many people have had zero problems with it. However, there are reports the ESC stopped working after going through water. These reports are few and far between and I’m not overly concerned with it. I just had to mention it for the sake of full disclosure. The maximum speed is definitely one of the most distinct advantages that the X-Maxx has over others. One of the most revolutionary systems within the X-Maxx has to be the Cush Drive System which delivers a lot of power to the truck. It includes All-steel Tough drive train gears and driveshafts that ensure maximum transfer of power. You might not find many monster trucks that can roll back onto their wheels, and you wouldn’t certainly expect it from a big machine like X-Maxx. However, it is equipped with a self-righting feature that allows you to put the Traxxas back on its wheels with just the press of a button. The Traxxas TQi Transmission system allows you to remain in full control of the vehicle at all times. It works on 2.4 GHz and ensures a maximum range of about 50 yards. As monster trucks are built for rough and rugged terrains, they need to be able to absorb the hardest of impacts. The high-performance GTX shocks are made from aluminum and filled with oil to ensure all impacts are dissipated safely. The overall quality of the build seems very sturdy and durable. The metal chassis of the truck seems to be sturdy enough to resist most impacts. Apart from that all the gears and parts are all metal as well. The axle is extra strong to ensure the tires don’t come flying off when going through a particularly rough terrain. The X-Maxx is made to be used by professionals or very knowledgeable amateurs. However, the truck is easy to handle for a true amateur as well. It comes ready to run, you only need to attach the battery and you are ready for some crazy off-road action! Its controls are easy to use and the ESC ensures you always remain in control. The self-righting button ensures the car can easily roll back up with the press of a single button. Also included on the transmitter is a knob for tweaking the TSM which will help the most novice of learners in their turns. So, anyone with a basic knowledge of an RC truck can easily manage the X-Maxx. It can easily plow through the toughest of obstacles on the dirt road. Its 4-inch ground clearance and 8 inches tires ensure that the truck always moves ahead without being halted by small rocks or other debris on a dirt road. It performs just as well in tall grass. However, the same cannot be said on a pavement. On the road, due to its enormous power the tires can break grip and it tends to slide around during turns and corners. This makes it harder to control in on-road settings. We loved the suspension geometry and the suspension settings on the X-Maxx. They ensure the Traxxas performs very well on rough ground. This ensures that no internal circuitry gets damaged when you are racing through the off roads. The large tires and the huge weight contribute to the excellent suspension system as well. This is where the GTX aluminum shock absorbers come in! They ensure no damage is done to the internal parts of the truck. With off-road tracks where you find a lot of hills and jumps, these shock absorbers can reduce the impact significantly and make landing a breeze. Another important feature is the wheelie bar. This ensures the car does not backflip when it is accelerating. It absorbs all impacts and keeps the car upright during rough landings. Another important factor to consider is how well the car handles. 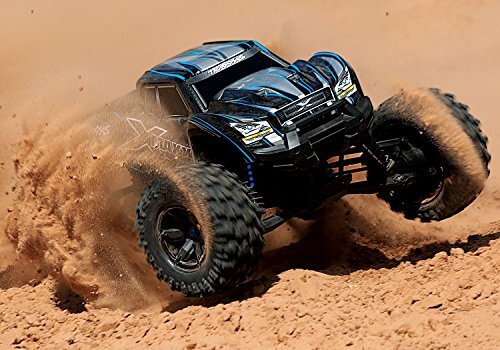 If you are looking for a truck that can handle easily, then you might want to check out the Traxxas X-Maxx. The TSM ensures the car turns smoothly and does not do traction rolls on the corners. The truck’s drive is 4 wheeled which allows full control over the car’s steering. Now, you might wonder how it compares to other popular brands out there. You might think you can get more features at a cheaper price! Well, we have compiled a detailed comparison between the Traxxas and 3 other popular brands. The Redcat Racing Volcano EPX is quite a tough competitor to beat. It features a 4WD, similar to the Traxxas. 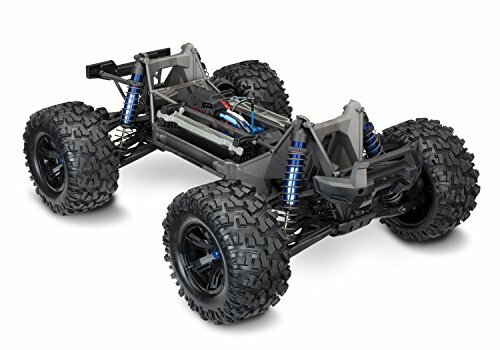 It has a longer interference-free transmission range of about 100 yards, while the Traxxas handles up to 50 yards only. Furthermore, the Redcat comes with the battery and charger included. However, its motor is a brushed one, which means you might need to replace it after some time due to wear and tear. The Redcat has clips as well which makes mounting on the body harder. The Traxxas, on the other hand, has a clipless body which makes it easier to handle. And of course, the top speed of the Redcat is about 20 mph while the Traxxas can reach 50+ mph. So, if you’re looking for more power, the Traxxas will serve you much better. The Hosim might seem superior at first glance due to the fact that it has similar features and includes a battery and a charger. The transmission range is about 87 yards which is a definite plus. A distinct advantage over the Traxxas is that the Hosim can easily climb over rocks. However, the top speed of the Hosim is only around 28 mph. Its controls are very basic and you cannot tune them easily. It is best served for beginners who want to test the waters for larger trucks, whereas the Traxxas is better for professional racers. Furthermore, the motor is a brushed one which makes it easy to get worn down. So, we can easily say It is not as durable as the Traxxas! 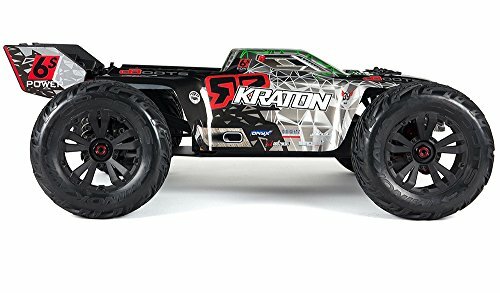 The Arma Kraton is quite similar to the Traxxas. It has a 4WD and a killer suspension system along with an interference-free transmission system. The steering servo and the receiver box are both waterproof. The motor is a brushless one as well. It does not include a battery or a charger. However, the ground clearance of the Arma is merely 1.3 inches while the Traxxas offers 4 inches of ground clearance. This drastically reduces the performance of the Arma. Furthermore, the Arma only has the capacity to hold a 6s battery while the Traxxas can hold an 8S battery. This means Traxxas can deliver a higher voltage and thus higher power! So, from our perspective, the Traxxas X-Maxx is specifically built for those who need that extra jolt of power to conquer the toughest of terrains. If you’re ready to step up to the big league of electric rc trucks, then the Traxxas 8S X-Maxx is the choice.